USMC Basic Field Gear Package, EXC. 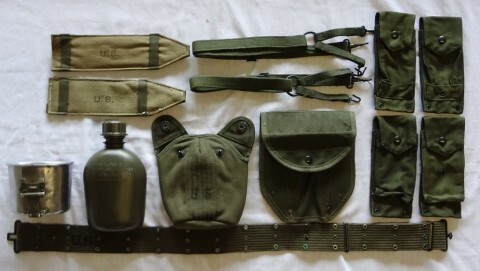 This is the basic M-1961 "deuce" gear for a Marine rifleman in the early to mid-years of the Vietnam War. Set includes M-1941 Suspenders, Suspender Pads, M-36 or M-56 Pistol Belt, M-61 Ammunition Pouches (4), M-1910 Canteen Cover, 1qt Canteen, USGI T-Handle Canteen Cup (VG) and M-43 Entrenching Tool Cover. All items are in excellent condition except as noted.